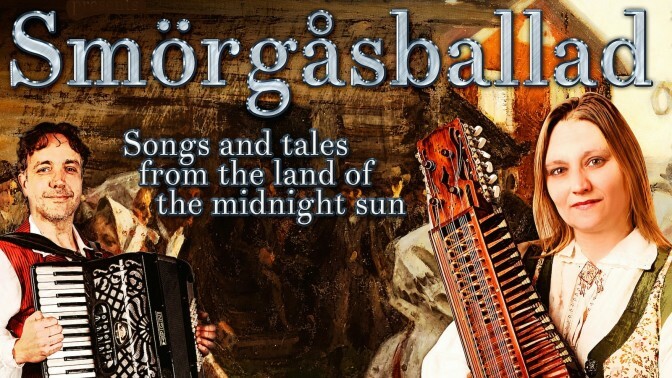 Smörgåsballad is an evening of music and tales from Sweden. Discover the tradition of the Easter Witches, what happens if you pick seven different wild flowers and put them under your pillow at Midsummer, the real meaning of the midsummer majstång, and join in some traditional drinking songs in celebration of the crayfish! A visual treat for the eyes and the ears, be transported to the land of the midnight sun, enjoy some “nordic noir tales” and fall in love with the heroes and heroines of old. Vicki Swan & Jonny Dyer have been touring on the folk circuit for many years. They were introduced into the world of storytelling by Nick Hennessey and the epic story The Whispering Road. Now they have developed a show to transport you into the magical realm of the Land of the Midnight Sun. Vicki was brought up roaming the forests and lakes of rural Småland in Sweden. Having intimate knowledge of the Taberg mountain, the home of the troll of the Piper and Troll legend, is one of the foremost players of the Swedish nyckelharpa players in the UK. Having inherited the same magical abilities as all nyckelharpa players, prepare to be bewitched! Jonny, as a baby, had his cradle underneath father’s piano and has inherited the magical knowledge of the fifth chord and isn’t afraid to use it. As one of the only users left of the original Ericsson mobile phone technologies Jonny is excellent at locating lost cows and also goats.